Initially Clarice Cliff wanted to be a sculptor, but in order to earn a wage, she started as a lithographer for AJ Wilkinson at the height of the First World War. The factory had an established reputation for reliable, though perhaps uninspiring, pieces. 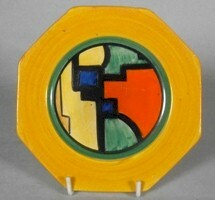 A Clarice Cliff Mondrian pattern plate, circa 1929. Little did they know what an influence their new employee was going to exert. Within a few years, she had managed to charm the chaps at the 'dirty end' of the business to surreptitiously supply her clay and presumably charmed others to get her models fired. Already keen to leave the print room, she often stayed on after work or modelled figures at home and was soon promoted as a painter. She didn't manage to charm everyone and whilst she was popular, her single-minded attitude often meant that she was referred to as 'that bloody woman'. 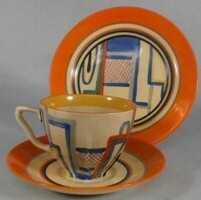 A Clarice Cliff Tennis pattern trio, circa 1930. A mixture of ability, sheer bloody-mindedness and her charm got her noticed by the factory owner's son Colley Shorter and so, by the mid 1920s, some of her models went into production with the bee hive preserve pot and the laughing cat being some of her earliest successes. However, her big break came in 1927 when she found a way of recycling the large volume of poor quality pottery that was acquired seven years earlier when AJ Wilkinson purchased the ailing Newport Pottery. Using thickly applied solid blocks of enamel, she was able to disguise flaws with her bold designs. Many suggest that a trip to Paris that year had a profound affect on Clarice Cliff and as it had hosted the 1925 Exposition des Arts Decoratifs et Industriel, which spawned the phrase 'Art Deco', it must certainly have been an influence on her. 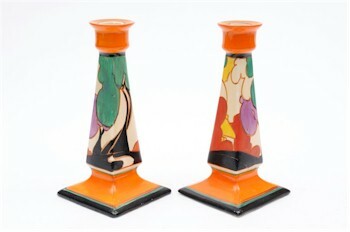 This first range had the glorious title of Bizarre and, from 1927 to the earlier 1930s, were decorated with geometric and abstract designs, such as Mondrian, Diamonds or the Tennis and Football pattern; flowers such as Floreat, Gardenia or Marigold; or 'woodblock' or cartoon-like landscapes in vibrant and sometimes surreal colours such as Orange House, Windmill or Lucerne. By 1929, the stock of Newport Pottery was diminishing so, with the popularity of Clarice Cliff's Bizarre range well-established, new shapes were needed. It was now that some of her latent sculptural abilities flourished and she produced the stepped square and circular vases and candlesticks, the striking Yo Yo vase, classic conical forms and the ultra stylish, but thoroughly unpractical, solid triangular handles. A pair of Clarice Cliff Autumn Balloon Trees pattern, circa 1932. Clarice Cliff's influence was, perhaps, at its strongest when artists such as Laura Knight, Barbara Hepworth, Frank Brankwyn, Vanessa Bell, Ben Nicholson and Dod Proctor all contributed tableware designs for the Artists in Industry project between 1932-34. After this watershed, her palette became a little softer and her influences increasingly more pastoral with designs like Lorna, Taormina and Trent though the best sellers from this period were the Water Lily Bowl and the moulded My Garden and Celtic Harvest designs. 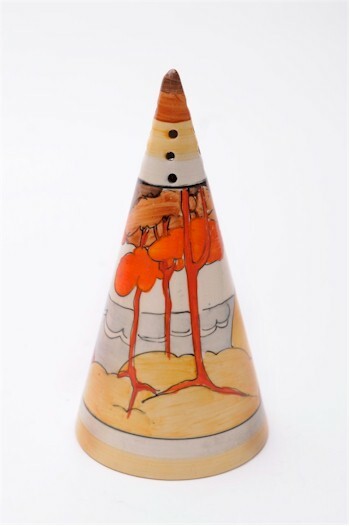 A Clarice Cliff Coral Firs conical sugar sifter, circa 1936. The Second World War took its toll and the company lost many skilled individuals either to the Services or the munitions factories, but whilst production continued, restrictions on decoration weren't helpful and AJ Wilkinson were unable to maintain their popularity. Although Clarice Cliff retired in 1964, she was effectively more interested in gardening than designing, so I guess it is rather fitting that her most popular and evergreen designs were the Crocus pattern and the floral variations of Rodanthe, Viscaria and Aurea.